Terri Carol, Hackney Empire. © David Secombe 1990. What was unique about the music hall performer Terri Carol, who has died aged 87, was that she bridged the gap between pre-television era variety and the variety which re-emerged in the 1980s. 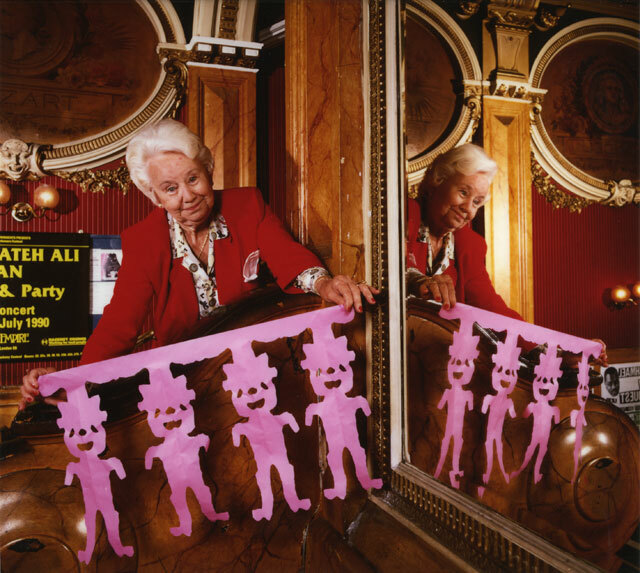 Terri was a paper tearer – she balked at the term origami – and became a symbol of the resurrected Hackney Empire in London’s east end. Her presentation stunned modern audiences. Coiffured, magnificently gowned, the grand old lady – who called people “darling” or “sweetie” – astonished young audiences with her skill. The act was a series of age-old paper tricks, accompanied by a patter delivered as asides. “If the government,” she would observe to the incredulous onlookers, “gave me a bit more pension I wouldn’t have to do this bloody thing. “I don’t drink, I don’t smoke,” she would add, “but I’m not a spoilsport.” The show proved it. Out of a flurry of paper would be launched ships, palm trees, lace doilies, steering wheels, occasionally enhanced by a dash of audience participation. The performance culminated with her astounding “tower of progress”, a 30ft- tall paper ladder which she would dedicate to a cause dear to her heart. The daughter of a music hall paper tearer, Terri was born in a Mitcham funeral parlour. She was educated at a convent school until, at the age of nine, her father taught her the paper tearer’s art and carried her off on a world tour with Sir Harry Lauder. The act, her father opined, was clean, and it would make her a living. By the time she was 12, she reckoned she had circumnavigated the world twice. She played Tokyo, took Paper Capers to the Radio City in New York, and claimed that, while doing seven shows a day in the US, she never saw the light of day. Her career peaked in wartime and she was described by the Daily Mirror in 1942 as “the pluckiest girl in showbusiness”. She performed with her baby in a crib, in the care of a stagehand in the wings. She played with Buster Keaton (“never sober to tell you the truth”), Carmen Miranda, Phil Silvers, Lena Horne, Max Miller and Laurel and Hardy. There was even a time when, she said, she lived in Park Lane, complete with a maid. Terri was married three times. Her first husband was killed, and after a brief marriage to a Pole she met on a train to York, she married Bill Lowe, one half of a popular comedy double of the 1940s whom she met – with his then wife – on a troop plane back from Germany. As the music hall declined, she toured the continent in the early 1950s, but by the mid-1950s her marriage had collapsed. Her father’s advice did earn Terri a living, apart from a spell which began in the 1960s when variety was dying. So she worked in the civil service at the ancient monuments department. A decision in the early 1980s to move to South Africa – and visit one of her daughters – was a disaster. Back in London and virtually penniless, she moved into sheltered housing in Croydon. But then, after the Hackney Empire reopened in l986, I spotted Terri performing in a “good old days” show, and became her agent. She subsequently appeared on Wogan, Friday Night Live, Barrymore, the Generation Game, and the Just For Laughs Festival in Montreal; she toured the New Variety circuit in London and went back to Japan for Nippon TV’s Comical Performers. There she was the only person present able to recall pre-war, pre-fire-bombed Tokyo. She performed for the Eurythmics in Nice, and at Tina Turner’s 50th birthday party. Terri retired officially when arthritis finally took its toll at the age of 80, and she found it too difficult to tear paper, yet she was still planning to perform for the reopening of the Empire’s main auditorium later this year. She is survived by two daughters. Terri Carol (Ivy Rosina Victoria Morse), entertainer, born May 25 1914; died January 31 2002. This photo of Terri Carol was taken in the foyer of the Hackney Empire as part of a series on ‘Speciality Acts’ which I shot for The Sunday Times Magazine. The feature was facilitated by Claire and Roland Muldoon, sponsors of new and old Variety theatre by virtue of their heroic work managing performers and rescuing the Hackney Empire from its fate as a defunct Bingo hall. Some might say that their achievement has not been properly appreciated: without their effort and enthusiasm, this grand Frank Matcham-designed theatre would have been pulled down in the 1980s. Some of the most magical nights I have ever experienced in a theatre have been at the Hackney Empire; sadly, since the Muldoons departed, the theatre may have said to have lost its pristine sense of purpose. The love has left the building. If there was any justice in the world, the Muldoons would still be in charge of the finest Variety Theatre in Britain and there would be a statue of Claire, Roland and Sid the balloon-juggling dog outside Hackney Town Hall. I saw Terri twice at the Hackney Empire in the 80s. She stuck in my memory because her performance and her material so belonged to another age yet still worked brilliantly to the alternative comedy audience that we were. She was funny, graceful and amazing. The question of course is – is there anyone alive who knows how to perform paper tearing? Was her passing the end of piece of vaudeville history?